I've been working on a binary system where each star has it's own planets, star A is 700 solar luminocity, while star B is 2 solar luminocity and they're 70 AU apart (a bit outside of star A's habitable zone). When i place a planet around star B, star A (100 times further away from star B) lights it up, while star B heats it, how can it even make any sence, isn't light directly responsible for heat, if yes, then star A can heat the planet better than star B, or is it a bug? This really isn't my field of expertise, but I can shed some light (pun intended?) on this problem. Most of the time, we refer to "light" as the type of light human eyes can see. This is known as visible light. But, light itself can be said to encompass a very wide spectrum known as the electromagnetic spectrum. 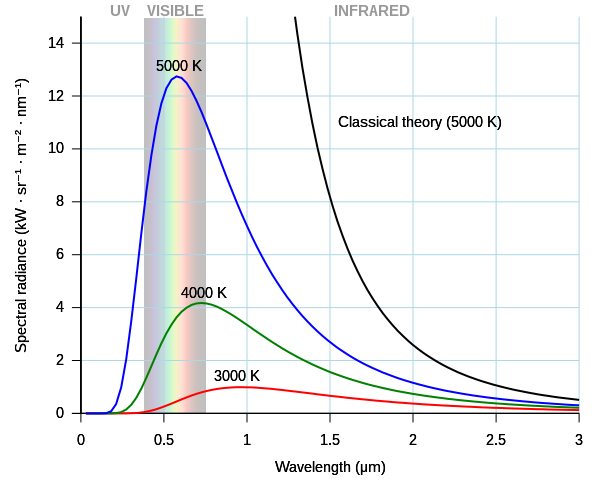 Our eyes can only see a very tiny fraction of this whole spectrum known as the visible spectrum. While stars do emit light, not all of it is given off in the visible spectrum. In order words, when you gaze upon a star, you are not seeing all of the light that is being emitted from it. You are only seeing the visible part of the spectrum that is emitted. Smaller, red stars emit most of their light in the infrared spectrum, which our eyes cannot see. Larger, brighter, bluish stars emit more of their light in the ultraviolet spectrum and above, which our eyes also cannot see. I believe that light does indeed equal energy. Energy can produce heat. However, the situation you have in your simulation is that a star with 700 times solar luminosity would emit a larger portion of its light in the ultraviolet spectrum. This light reaches the planet and heats it, but our human eyes can't see it, because it's not part of the visible spectrum. Being 700 times more luminous than the sun, a huge amount of energy is released. Therefore, we get a lot of heating happening from the ultraviolet light, but we don't see the planet being lit by that star because there's just not that much visible light for our eyes to perceive. Just an additional note, luminosity is not how "bright" a star is. It is a measure of how much energy is being emitted from it. Not all of this energy is given off in the form of light we can see. 700 times solar luminosity is not 700 times as bright as the sun; it is 700 times more energy than the sun. Right. Thanks for the correction. But that's not the case. Star A has 350 times the luminosity of star B, they are 70 AU apart, and i placed a planet (Bb) 100 million km (approx. 0.7 AU) away from B. Let's say that Bb is between A and B, the problem is the night side of Bb is brighter, but i know that B gives most of the heat to Bb, since Bb's temp is 133°C, which is closer than the habitable zone of B, but way further than the habitable zone of A. Given that distance difference, isn't Bb's night side supposed to be equal to the brightness of Saturn, and the day side supposed to be as bright as Mercury? But it is the opposite, the night side waaay too bright, and the day side looks like a shadow blocking the light from star B. Even weirder: it's also the case when star A is 15000 solar luminosity and star B is 0.009 solar luminosity, but the're 100 ly apart, and Bb orbiting B in a distance of 8 million km. Needless to say: Both cases should at most at the night side of Bb just see nothing but a relatively bright star. Right. I think I understand what you are talking about. I recall something similar happening when I was designing a binary system of my own. Even at 70 AU, a star 350 times the luminosity of the sun should still be respectably bright. Could you try lowering the luminosity of Star A (the brighter one) and seeing how that changes the lighting? If this issue persists, what I suggest is to post a screenshot of it on here. The devs check these forums so a screenshot will help them to identify this issue and see what they can do about it. Alternatively, you can send an email directly to the devs to report this problem via here. So, in the "night side" picture shows the enlighted surface while star B is in the background, while the"day side pic shows star A in the background. I think i know that star A can light up the planet because of the relatively close distance, but shouldnt the side where star A lights up be dimmer than the other side, like way dimmer? Yeah, unfortunately, I don't know the specifics behind the codes for a star's light. Star A is very luminous as you said, so it's not implausible to say there is still enough light to turn night to day on the planet. For a star 350 times the luminosity of the sun, 70 AU isn't that great a distance. It is best if a dev confirms what is happening here. They're usually around so you should receive a reply from them soon, but you can always report it through the link I sent earlier.